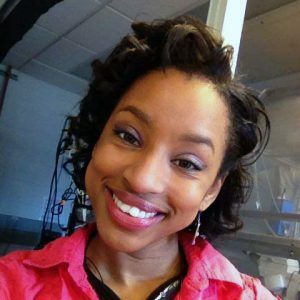 Talking with Chanel Matney, a neuroscience graduate student in the Brown Lab, can send your mind racing in many different directions as she discusses her passions and interests and gives sage advice. A native Marylander from a family with diverse career paths ranging from medicine to performance art, Chanel is the sole basic science researcher. Though her family has a difficult time differentiating a neuroscientist from a neurologist, she is remarkably adept at describing the questions and interests that drive her. To answer these questions, Chanel studies how neural pathways guide sensory information. Specifically, she is interested in the pathway between the cerebral cortex and the thalamus, a pathway known to be integral in the processing of incoming sensory information. Currently, through a variety of techniques, she is testing the hypothesis that the neurons in this pathway are not a homogenous group but rather fall into a number of subpopulations, each of which have their own function in information processing. This project is fitting for Chanel, as it is obvious that her own interests, like the very neurons she studies, are not of the same group. Each passion is rooted in a different field, including law, neuroscience and the arts, creating a unique part of Chanel and giving rise to a beautiful network of ideas. Interested parties stay tuned; she is working on a podcast and blog! One Comment on "Neuroscience Graduate Student Driven by How the Brain ‘Sees’"
You have captured this young lady but definitely. I am proud to know her and call her a dear relative. My guess is that we will be reading more and more about her and her research for a long time to come.